Summer officially begins on June 20, but we all know memorial day is the unofficial start of summer in the US. All around me I see the signs of summer, especially living in Southern California, it seems we get an early start with our weather. Although we do have amazing weather most of time, the month of June is a strange time in California. We have this rare occurrence called June Gloom, I didn't realize till recently this only happens here on the west coast and not all over the country or even other parts of the world. I won't get all nerdy and scientific about it, but it basically happens most of the month of June. We have major gray clouds that cover the sun, and the sky is gray and gloomy, sometimes for the entire day. It's a strange occurrence since we are known to be a sunny state most of the year. Recently I have noticed how June Gloom will affect my mood, making me feel down and even depressed. This is not a great feeling, and sometimes I am not sure how to snap out of it. This months #UntamedStyle theme is all about Summer Style, but kinda difficult to get into summer mood when the weather does not reflect the season. 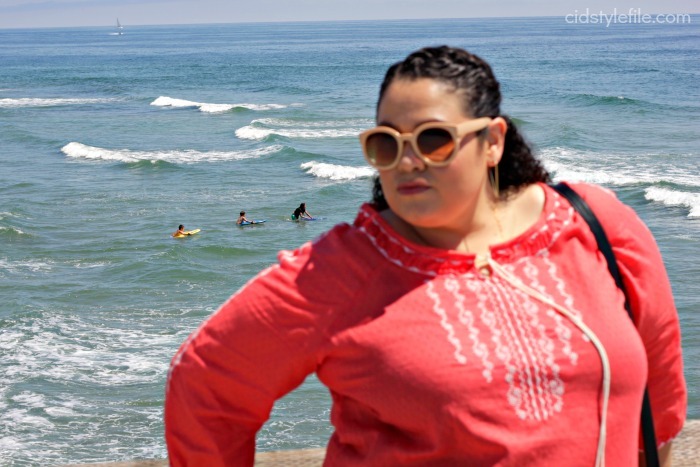 I had a cute summer dress outfit planned for this weeks post, but the weather ruined it. Ugh I woke up to really gray, gloomy and cool weather. It made me feel moody and just uninspired. So I came up with this outfit instead. My BF suggested we head to Newport Beach and take some pictures. Good thing he convinced me to stop moping around and get out of my pj's. Although this was not the intended outfit, I think it turned out OK. I decided to add some color to my usual dark outfit, to help lift my mood. I normally don't wear bright or lighter colors, but this top caught my attention (which I also have in black, of course). I really do think color helps change and affect your mood. Thank goodness, once we arrived at the beach the sun started to peek through the gloomy clouds. The day turned out perfect, we had some sunshine and a wonderful ocean breeze. My mood and spirits were lifted and I was so happy to be outside enjoying life! There is just something so magical about being by the ocean, breathing that sea air and witnessing natures beauty. Sometimes I use to feel a bit awkward taking pictures out in public, wondering if people think I am being vain or self absorbed. Honestly I don't care anymore, I am doing what makes me happy, and its not about being vain. I think of it as self care and self love. Fashion and blogging makes me happy and keeps me going on days when I feel like hiding under my covers all day long. As I've gotten older I've learned that no matter what you do in life, some one will complain or dislike what you do. At some point you have to make yourself happy, regardless of what other may think or say. This is one of the reasons I started #UntamedStyle, to not be bound by any ones rules or standards, but my own. I hope other women do the same and express themselves via fashion. This summer I want to do more outdoor activities and have fun outfit pictures to share on the blog. My style is a bit more casual and minimal, which is what I like. Looking back at some of my other outfits, I tend to wear jeans a lot. I thought my outfits may be too boring to share on the blog, but hey this is my blog, I'll wear and share what I like. I hope more of you feel the same and share your outfits here on Fridays. I am happy with the turn out so far and response to my linkup, hope it grows more each week. 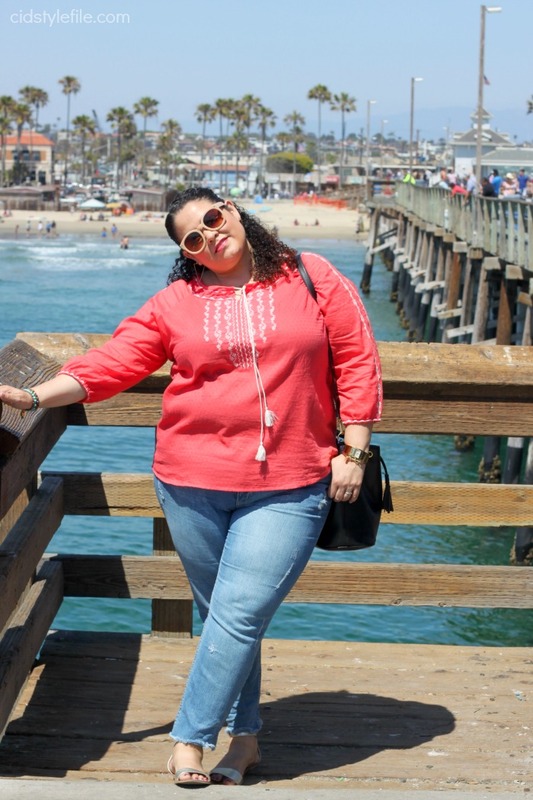 Thank you to all the blogger who linked up to #UntamedStyle first linkup! 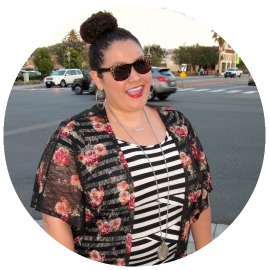 I had fun reading all the blog post and getting to discover new (to me) bloggers. I hope some of you got a chance to discover new blogs and bloggers to follow as well. This week you have another chance to linkup any post featuring summer style, whether it be an outfit, beauty, hair or design related post. As promised here are my 5 favorite post who linked up. It wasn't easy since everyone had great content, but I'll stick to 5 post or you will be here all day reading this blog. 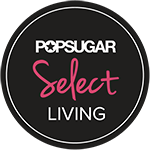 Go show some love to these fabulous ladies and visit their blogs. I loved all these looks, each one looked happy and confident expressing their unique style. Go read her blog for thought provoking post and inspiring style. I love her outfit, with pops of color and her fab tee. 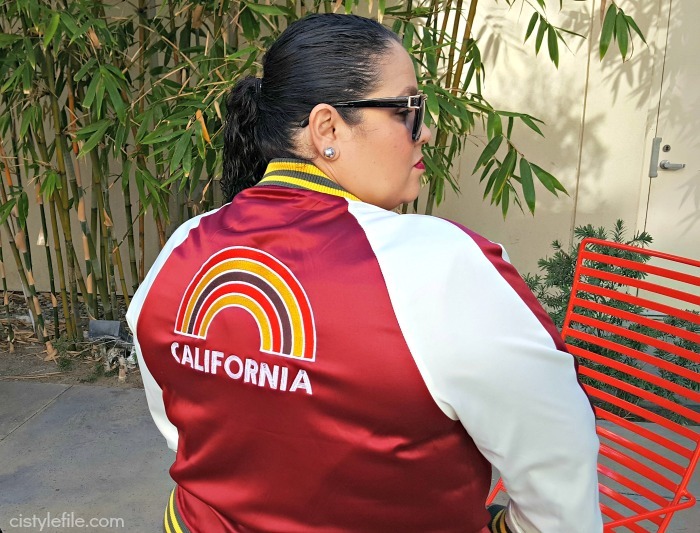 She sure is slaying in her look and in her blog. I really liked Shelbee's outfit with the cute tee and leopard slip on sneakers. Shelbee is also a very good writer, and you will enjoy her deep thoughts. she was my Lucky FABB conference buddy until they went out of biz. She looks so adorbs in this off the shoulder dress. Go see all her other cute and stylish outfits. Well who can resist Nicole's smile and fab leopard print look. I was so intrigued to learn she lives in Alaska. You may be featured! I will select my favorite 5 blogs who link up, to feature the following month. Be creative, have fun and just be YOU!! Veronica, I am so flattered and honored to be included in your 5 favorites from last week. Thank you so much for your kind words! And who doesn't get in a brighter mood when you pop on some bright and cheerful clothes! And everyone loves jeans, so keep on showing us how you style your jeans! I actually get more positive feedback when I style more casual outfits because that's where many women I know have trouble finding inspiration! Your outfit here is adorable! Looking forward to seeing more of your fun and fabulous style! I understand the struggle with taking pictures in the public, I am a very shy person and I used to take most of my pictures in my backyard lol. I am glad to be coming out of my shell now. Blogging has that power to fight some of those insecurities, it's taken me out of my comfort zone so many times.Love the detail on that top. And thank you SO VERY MUCH for showcasing my look. I love you!!!! Ha! I felt the same way about photographing in public, for like two weeks! Then, I thought, screw it! I'm 48, don't I get to be the crazy lady who does whatever she wants in public? And living in Michigan with lots of gray days, especially in the winter, it does effect your mood. The key is to recognize it's the weather, not you, and do something that perks you up. Take care for the rest of June! Thank you so much for including me! Wow! That means a lot to me. I will definitely check out the other blogs. 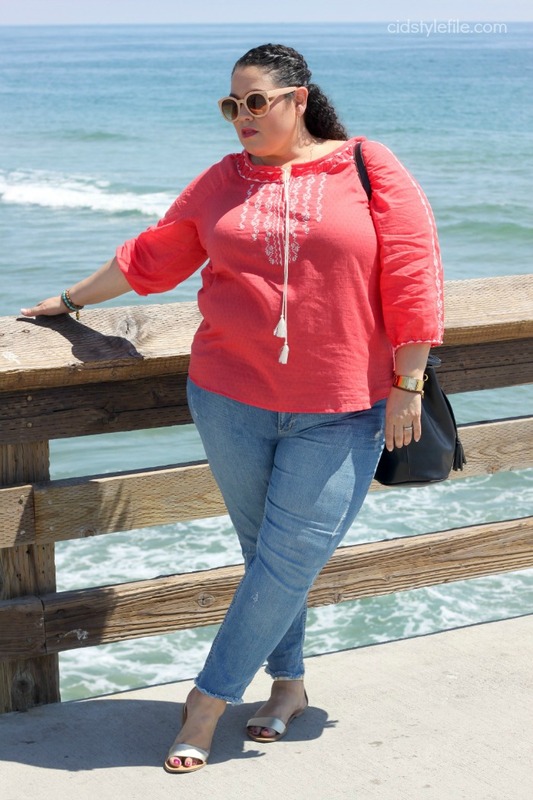 I love that coral top on you! Pretty! Even though summer hasn't officially began the brutal heat has rolled in. Found myself staying in with my better half and having food delivered. Great linkup Veronica, and I love the peasant top. The heat is crazy here, but what a nice summer tunic. 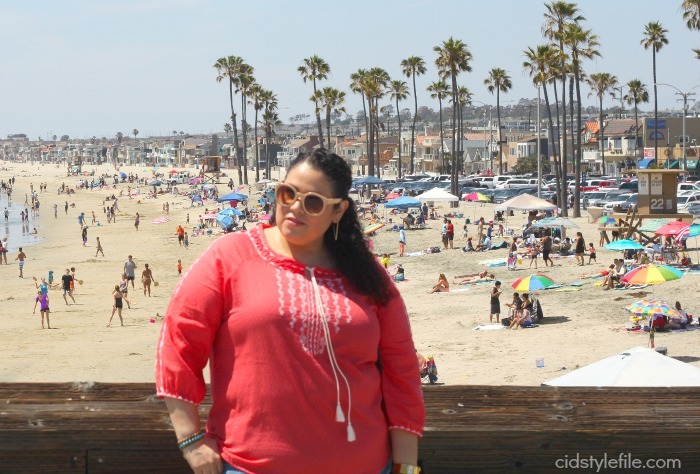 Love your beach pics and cool tunic top. You look great! I'll link up and put you on my list so I remember every week! Thanks so much for sharing with Fun Fashion Friday! 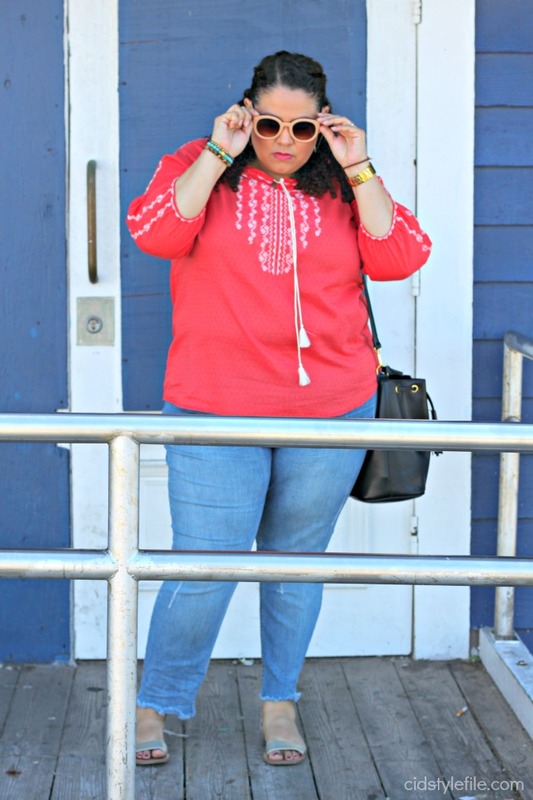 Love the tunic and those shades!! Thanks for stopping by The Mummy Chronicles link up! I can totally relate with June Gloom. I hated it when I lived in SD. In May this year it rained 23 days out of 31 here in DC. I felt crazy!! 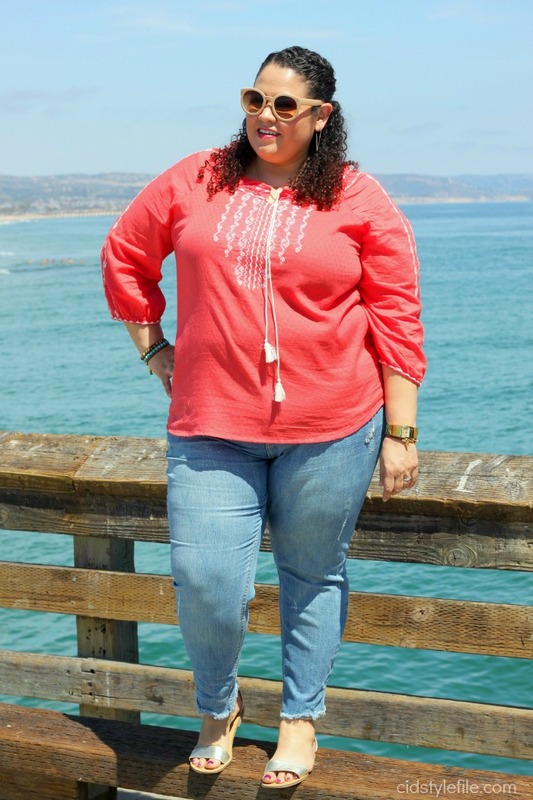 Your embroidered tunic is a very pretty color on you and looks great paired with your jeans! Up until a couple of years I ago I had no idea California went through June Gloom - seems so odd to me. We are definitely in full on summer mode here in the south and battling temps in the 90s already. Thanks for linking up with Fabulous Friday! Hope to see you back next week. I actually don't mind the gloom since it helps to keep the temps low. I love your vibrant top with those frayed jeans. YES! We need that Vitamin D!!! My mood is always a little bit on the low side during our gloomy winter. Such a cute look - that color is amazing on you!!! OMG! Yes, to everything. I think I get that SAD (seasonal affective disorder) because I hate gloomy and cold weather. I definitely feel depressed when there is no sunshine. And I still try to find an out of the way spot for outfit photos, because if not, then all the photos look them same because they are outside in my patio. I haven't figured out how to be like Elsa and let it go, yet. Thank you so much for featuring me in your five faves. This week isn't very summery for me in NorCal either. I was at a very windy and cold lighthouse. Hahahahaha! Yay Summer!